A review of Jackie Minniti's new novel, "JACQUELINE"
The very best fiction is usually based on some truth whether it be personal or historical. 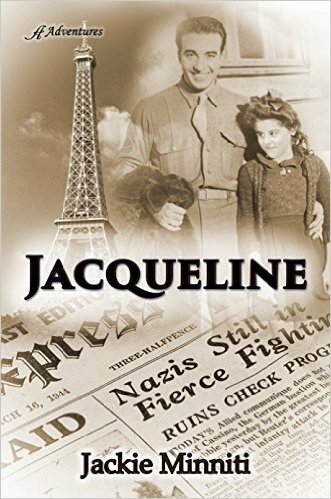 Author Jackie Minniti combines both in her compelling novel, Jacqueline, a story of a young girl and her family's tragedies and triumphs set to the backdrop of World War II occupied France. Though written for middle-graders, the novel is able to reach and inform all generations of the horrors of war as seen through the eyes of a young girl devastated by the news of the loss of her adored father. In the story, we watch fascinated as Jacqueline and her mother overcome starvation, persecution, and the loss of their beloved neighbors who were brutally dispatched to a Nazi concentration camp. Jacqueline’s story is told in a sincere voice that draws you into the drama and will have you rooting for her prayers to be answered, to make her life back to what it once was before her world turned upside down. Minniti has used all her skills learned in twenty-five years as an instructor in the New Jersey school system to tackle a complicated and horrific time in history and simplify it for young boys and girls to learn while being entertained. Just as, The Diary of Anne Frank, was able to do, Jacqueline will have middle graders, as well as adults, charmed and fascinated by this young girl’s tale of heartache and hope. I think I’ve been writing since I could hold a pencil. As a kid, I wrote a little newspaper (using carbon paper – really old school!) that I sold for a nickel a copy. I started writing poems when I was in 6th grade and was into writing short stories in high school. I got involved in journalism during my teaching years when I wrote a series of columns about educational issues for the Courier Post – a fairly prominent daily in southern New Jersey. But it wasn’t until I retired that I found the time to begin writing seriously. When I got my own byline in the Courier Post, I started to feel like a “real writer,” but I didn’t feel truly validated until my first novel, Project June Bug, began winning literary awards and getting positive reviews. I guess I had an idealized view of a writer’s life - I’d write the great American novel, and readers would beat a path to my door. I never expected it to be so hard to get noticed, and I never thought I’d have to spend so much time marketing. Salesmanship has never been my strong suit! I feel much more centered. Being published has taken a lot of the pressure off. I’ve accomplished what I set out to do, and when I decide to write another book, having a proven track record with Anaiah will make things a lot easier. I’m in a really good place now. My first book was self-published as a print-on-demand, but it was so difficult to get noticed that I decided to go the traditional route for Jacqueline. It took a full, grueling year of query letters, rejections, and near misses before I landed the contract with Anaiah. I’d probably go the traditional route with Project June Bug and submit to small, independent presses instead of trying to do it myself. At the time, I didn’t have the confidence or the patience to go through the submission process, but I think the book would have gone further in the long run if I’d done that. Blogging, a column in newspapers, writing new material, rewriting, submitting new work, waiting, promoting published work…the list is large. How do you manage to divvy up your time to give adequate attention to all needed areas? Since I’m retired, I can devote as much time to writing as needed. Journalistic writing is fairly easy for me. I can turn out a 600-word column or blog post in a couple of hours. Writing fiction is another matter entirely. It requires much more of an emotional investment. To do that, I need long, uninterrupted periods of writing time. Since I’m a night owl, I get a lot accomplished late at night when the house is quiet and there aren’t any distractions. I try to get my non-fiction writing done way ahead of my deadline to clear the calendar for the rest. It also helps to have an understanding, supportive spouse, especially one who’s a phenomenal chef. Fortunately for me, I do. That would definitely have to be getting “The Call” from Anaiah offering me a contract for Jacqueline. My husband was skimming the pool, and I came flying out the door and almost knocked him into the water! I was disappointed that I couldn’t land an agent to represent Jacqueline. As it turned out, I didn’t really need one, but rejections are never easy. I got an email from the daughter of a WWII vet who had served in the same unit as my dad. She was so excited about the book that she bought copies for her four siblings. She said I did our fathers proud. That meant a lot to me. There are a lot of middle grade novels about WWII and the Holocaust, but there aren’t many set in France. I think that gives Jacqueline a unique perspective. Another thing that makes Jacqueline different is that even though it’s fiction, it has the authenticity of personal history because it is based on my dad’s experience. Don’t give up. When I was going through the submission process, I’d often get discouraged and wonder why I was putting myself through this instead of walking on the beach. But it was worth all the frustration and stress to finally hold that published book in my hands. Believe in yourself, and someday you’ll get there too. I’ve found that the internet is the best way to get the word out about a book. It’s very time consuming, but it’s a great way to reach a lot of people at little or no expense. I’m not good at face-to-face promotion. As I said, I’m definitely not a salesperson, so I find it very difficult to pitch my book in person. I’m much more comfortable doing it in writing. When ten-year-old Jacqueline Falna hears her mother’s scream, she doesn’t realize that the axis of her world is about to tilt. Her father’s plane has been shot down by German fighters. In the midst of poverty, food shortages, air raids, and the grinding hardship of daily life under Nazi rule, she forms an unlikely alliance with a twelve-year-old Jewish neighbor who poses as her cousin after his family is “relocated” by the Nazis. When Rennes is liberated, Jacqueline meets an American soldier and becomes convinced that he has been sent to reunite her with her father. Based on a true story, “Jacqueline” is a tale of family, faith, unusual friendships, and the resiliency of the human spirit set against the backdrop of occupied Rennes in 1944. It’s available on Amazon (in Kindle and paperback,) from any online bookseller, and anywhere else books are sold.